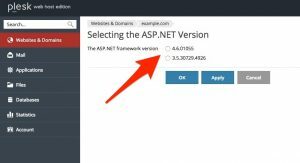 How To Change ASP.NET Framework Version for your domain or subdomain in Plesk Control Panel? ASP.NET is a flexible set of tools and web development technologies that allows you to employ a number of applications based on ASP.NET framework. 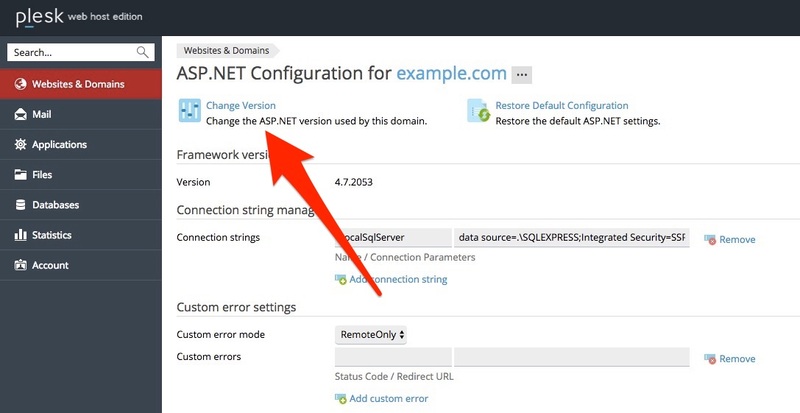 Plesk supports 1.1.x, 2.0.x and 4.0.x versions of the .NET framework and allows configuring most of its settings. 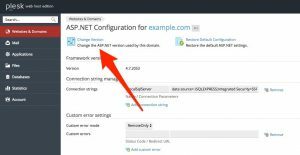 Most ASP.NET configuration settings that commonly need to be customized in order for ASP.NET applications to function in a desirable way can be edited through Plesk. Go to Websites & Domains. Locate the name of the domain or subdomain you wish to change the ASP.NET version for. Note: Our windows servers support ASP.NET 2.0 to 4.6. For ASP.NET 3.5 and 4.6, set it to asp.net 4 and mention the same in the web.config file. How To Change OR Reset an Email Password Through Plesk? How To Change PHP version for your domain or subdomain in Plesk Control Panel? How To Add a Custom DNS Record in Plesk Control Panel? How To Add Domain Aliases in Plesk Control Panel? How to Delete or Remove Subdomain from Plesk Control Panel? Copyright © 2019 HostJelly IT Services Pvt Ltd. All Rights Reserved.